Acne is a common problem and strikes men and women of all ages. Hormonal changes in your body are the main cause of acne breakouts. Teenagers and women going through menopause can attest to this fact. Hormones trigger your sebaceous glands to produce too much sebum, the natural oil used to lubricate your skin. The sebum builds up in your pores along with dead skin cells and blocks your sweat glands. Bacteria then enter into the picture and acne is formed. Acne is not caused by not washing your face, in fact excessive washing can irritate and spread acne. Always be gentle and use lukewarm water and pat your face dry. This will help to prevent the spread of the bacteria that causes acne. To better understand what causes acne, it is good to understand the different types. You may have only one type or a combination. Acne vulgarism are cysts and nodules that are deep in your skin. This type of acne should be treated by a dermatologist as it can cause scarring and prescription medication is needed to treat it. Blackheads are formed by a partially blocked pores. Dead skin cells and sebum blocks the pore and the melanin in your skin cells cause blackheads to develop a dark appearance. Whiteheads are completely blocked pores. These are characterized by small white bumps caused by trapped sebum and dead skin cells. Papules are small red, inflamed and tender bumps that do not come to a head. Pustules are what most people think of as acne. These lesions are red, inflamed and can be tender to the touch with a large whitehead. You can treat your acne with over-the-counter products, but these can be very drying and irritate your skin. Common treatments include products containing benzoyl peroxide, salicylic acid, sulfur and resorcinol. Prescriptions medications can also be very hard on your skin and carry some risk of side effects. You doctor may prescribe medications like Accutane, oral contraceptives, oral or topical antibiotics, and prescription strength benzoyl peroxide treatments. Before you make a trip to the drug store or your doctor give homemade acne mask treatments a try. Many of the ingredients you need are already in your pantry. 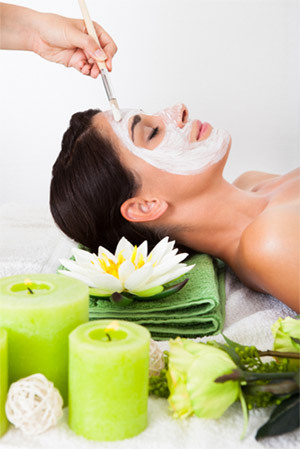 Face masks recipes for acne shared with you are natural and take only a few minutes to make. Simply mix baking soda and water into a paste and apply to your face after you cleanse it. Leave the mask on for 20 minutes and then rinse off with warm water. You can use this mask three times a week. Egg whites are great to tone and firm your skin. Egg yolks contain Vitamin A to help prevent scarring. Simply separate an egg and beat either the white or yolk and apply to your face. Leave on for 20 minutes and rinse with warm water. Don’t use these masks if you’re allergic to eggs. Take 3 teaspoons of fresh basil and steep it in boiling water until it cools. Apply to your face with a cotton ball. This mask helps to clear your skin and tone it. If you don’t live near the ocean you can still get its benefits with this simple mask. Mix sea salt and water into a paste. Apply to clean skin and let sit until it become hard and crusty. Rinse with warm water and pat dry. Mix oatmeal, honey and water to make a thick paste. Apply to your skin after you have cleansed it and let it sit for 20 minutes. Use a damp warm cloth to soften the mask and then rinse with warm water. The oatmeal will draw out excess oil and honey has many healing and antibiotic properties. Use organic honey if possible. Mix rosewater and cucumber paste together and apply to your clean face. Let sit for 10 minutes and then rinse with warm water. Peel and mash 8 cloves of garlic and apply to your face. Be sure to avoid the eye area and leave on for 15 minutes. Rinse with warm water and then tone your face with some vinegar on a cotton ball. Garlic has antibacterial properties and vinegar balances your skin’s pH. Mix 1 teaspoon of groundnut oil and 1 teaspoon of lime juice. Apply to your clean skin and let sit for a few minutes. Rinse with warm water. You can use this mask everyday to treat and prevent blackheads. Grate one apple and mix with honey. Apply to your skin and let sit for 15 minutes. Rinse with warm water. Apples have pectin and vitamins that soothe and clarify your skin and honey has antibacterial and anti-inflammatory properties. Try these homemade acne masks to treat mild to moderate acne. Be sure to test the masks on the inside of your wrist to be sure you aren’t allergic to any of the ingredients. Save money and use what you have in your kitchen to treat your problems.